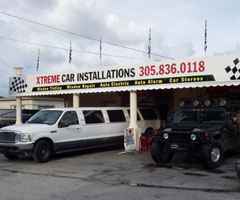 Xtreme Car Installations is an Alarm, Audio and Video Company with 15 years of experience and one of the few places offering Lifetime Warranty on our Alarms and Tinted Windows, using today is most reliable and trusted brands.All of our technicians have a minimum of ten years experience in their specialty. Our attention to detail ensures that no vehicle leaves our facility unless it passes Quality Control. That is a comforting thought to our clients, who trust that they will not have to come back for follow up work. Our opening hours are Monday-Saturday 9AM-6PM. Call us at (305) 836-0118 for more information.